Gianvito Rossi strappy leather sandals. 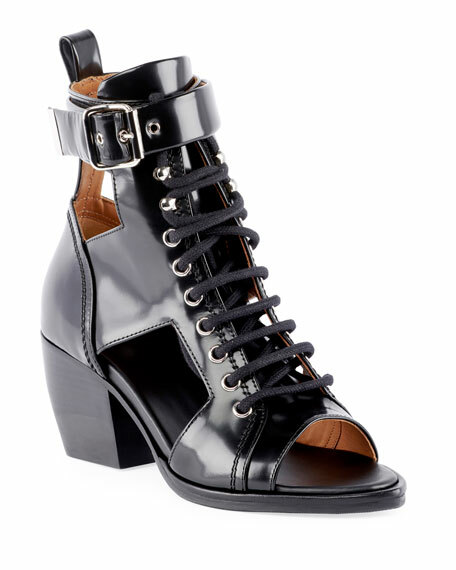 Chloe sandal in pebbled calf leather with buckle accent. Flatform heel wrapped in crocodile-embossed leather. Thong strap. Slide-on style. Padded footbed. Rubber outsole. "Wave" is made in Italy. Christian Louboutin smooth leather sandals. 4" covered stiletto heel. Strap bands open toe. Two ankle straps with adjustable square buckles. Cutout heel counter. Signature red leather sole. "Multipot" is made in Italy. Jimmy Choo cork-wedge sandals in leather with crisscross upper and braided-jute trim. 4.1" wedge heel with platform. Crisscross strap bands open toe. Adjustable ankle strap. Leather lining. Manmade outsole. Made in Italy.